Meeting Management is the process of managing the stages and components of the entire meeting process. The actions that make meetings successful before, during, and after the meeting are equally important. Neglecting any piece of the meeting management process can lead to poor results and additional meetings. Sound difficult? Don’t worry, MeetingBooster meeting management software handles the hard work for you. Start by asking yourself “what’s the purpose of this meeting”? If you can’t answer that, then you shouldn’t have the meeting. Deciding what topics should be in the Agenda can seem overwhelming at first, but defining the purpose will help. Meeting Agenda Software like MeetingBooster simplifies the Agenda process using an intuitive MS Office style interface and industry standard agenda templates to help you get started. You can add attachments, designate topic presenters and times, even ask attendees to provide suggestions to be added to the agenda. MeetingBooster helps you build a professional agenda in a matter of minutes, increasing productivity and improving the effectiveness of the meeting. To simplify the scheduling process, MeetingBooster integrates with popular email clients like Outlook and Gmail, allowing you to schedule a meeting with no change in habits. When it comes to distributing the meeting agenda, it should be sent out prior to meeting, allowing attendees to properly prepare. This is easier said than done when using traditional methods such as MS Word and email. MeetingBooster's automated distribution feature allows meeting organizers to send the agenda to the attendees with one-click. Add your company logo, select an agenda style, or add a cover page. MeetingBooster guarantees attendees receive a professional looking agenda every time. Be sure to start the meeting on time and don’t forget to, take attendance. It is important to know if the decision makers are present. If not, you may want to postpone the meeting. If you assigned preparation tasks for attendees, this is a good time to review if the tasks were completed. MeetingBooster makes this process easy by displaying the meeting roster and preparation task list prior to starting the meeting. With a few clicks you can track attendance and task accountability, which will improve the effectives of the meeting. When running the meeting, it is a good idea to display the Agenda and assign a note taker. This way the presenter can focus on discussing the topics. 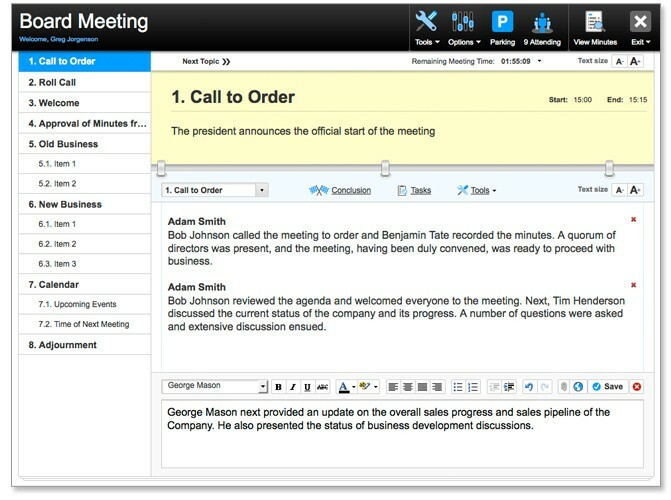 MeetingBooster makes this stage of meeting management painless. Note Takers can quickly select an attendee, document conversations and use Meeting Tools like Voting to make decisions. All information is transferred directly to the meeting minute’s document making this stage seamless. Let’s face it, most meetings are all about the action items. 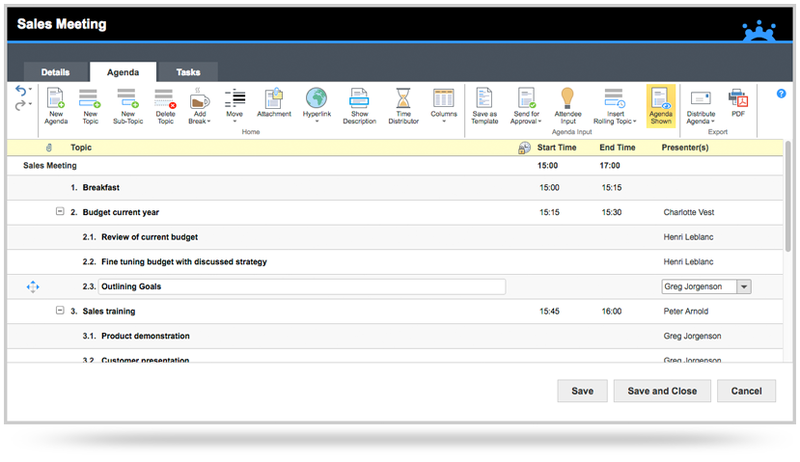 MeetingBooster’s powerful task management system lets you define and assign tasks on the fly. MeetingBooster automatically distributes tasks to each attendees’ Task Tab, where they can easily update task status. This improves overall accountability of this meeting management stage. Meeting minutes are the consolidation of the discussion, decisions and tasks that were captured during the meeting. The processes of meeting management lead up to this one document, so be sure that it is worthy of distribution. MeetingBooster automatically generates the minutes using custom styles and formatting options, easy-to-use editing features, automatic distribution and archiving. MeetingBooster ensures the important information from the meeting is presented in a professional, simple to review manner. Meeting Management is a continuous process and analyzing factors related to meetings activity helps organizations improve meeting performance, contain meeting costs and instill proper meeting procedures. Unfortunately organizations typically lack the capability to properly overview meeting activity. MeetingBooster’s Analytics Dashboards add transparency to meeting activity. 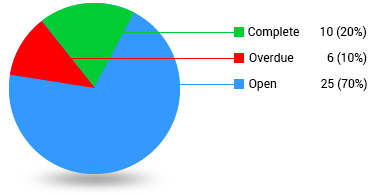 As users follow the MeetingBooster system, over time both quantitative and qualitative data is captured and reproduced in unique dashboard reports which help improve meetings across the organization. If you are struggling with meeting management, the first step is to recognize the problems that exist. Then take the necessary steps to improve the process.